All-American barber shop plus 21st century technology and luxury equals fine men's grooming. Introducing Upper Cuts Gentlemen’s Grooming Place® The Ultimate Grooming Experience for Men is now open in Washington, DC. 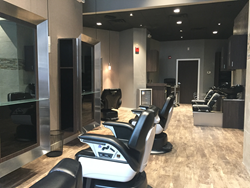 As an upscale male-centric location where men can receive high quality grooming services, Upper Cuts has taken the classic All-American barber shop to the next level. Upper Cuts Gentlemen’s Grooming Place® is a distinguished “man cave” for men's grooming where today’s businessmen can receive classic services such as hair care, shave, shoe shine, manicure and pedicure. From hot lather shaves to luxurious hand and foot care to precision haircuts, the focus is superior service. With its cool gray colors and black accents, the décor is warm and inviting. The motorized leather chairs provide immense luxury with their heated seats and footrests and full massage features. Adding to the ultimate experience, TVs have been carefully engineered into the mirror of each station. Combining the latest in luxury in men’s grooming with the best technological advances creates the distinguished “man cave.” Upper Cuts’ service professionals have 40+ years of combined experience – all possessing a highly skilled expertise in their respective fields. They are the best in the industry. Upper Cuts also offer the highest in quality men’s grooming products, including Baxter of California, Jack Black, Mitch by Paul Mitchell, Woodies and Dermalogica. Hours: 7:00 am – 6:00 pm Monday – Friday. Appointments can be made on-line reservation system: http://uppercutsdc.com/appointments/. Walk-Ins are also welcome. Upper Cuts Gentlemen’s Grooming Place ® of Washington, DC is independently owned by Upper Cuts, LLC. The store is located at 716 14th Street, NW, Washington, DC 20005. For additional information, please go to uppercutsdc.com or call 703-328-6831. Upper Cuts, LLC also owns Upper Cuts Gentlemen’s Grooming Place ® of National Harbor, MD and Upper Cuts Salon & Spa ® of National Harbor, MD, which will open in March 2016.